Visible Good and members of the US Army team spent a full day on top of Mount Washington, where the site was closely reviewed and analyzed as a potential Field Test site for the Army developed Arctic Shelter System designed and manufactured by contract holder Visible Good. The visit was used to explore adequate testing sites for the 400 sf version of the Arctic RDM. No plans have been finalized, but the experience of subjecting the extreme-weather version of the RDM to some of “…the worst weather on Earth…” is exciting. Wind conditions often range between 100-200mph at the observation point, coupled with temperatures as cold as -50 F and snowfall of as much as 4 feet in 24 hours. Mt. Washington might just be ….The ultimate cold weather test conditions. Mount Washington’s weather is notoriously extreme. 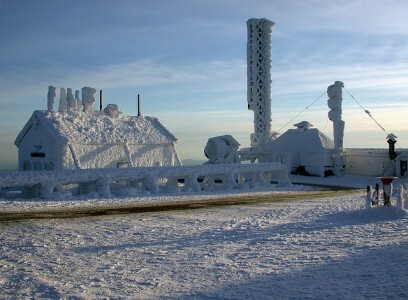 In winter, Mount Washington experiences sub-zero temperatures, hurricane-force winds, snow and ice that essentially turn the peak into an Arctic outpost in a temperate climate zone. In fact, winter conditions at its summit can rival those of Mount Everest.